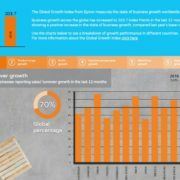 The market research institute CounterPoint today released the global smartphone market report for the third quarter of 2018. 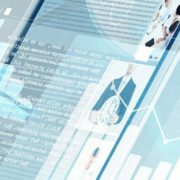 The overall scale fell by 3% to 386.8 million units, which is the third consecutive quarterly decline. However, Xiaomi and Huawei are very eye-catching. 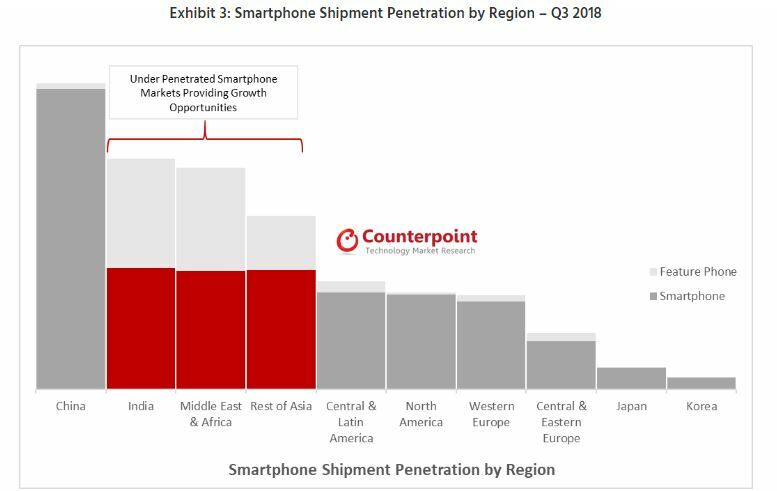 Counterpoint’s deputy director, Tarun Pathak, believes that the decline in the global smartphone industry can be attributed to weak demand in developed markets such as China, the US, and Western Europe, which account for almost half of global smartphone sales. Among them, Samsung ranked first with 72.3 million parts, but it lost 13% year-on-year, and its market share dropped to 13%. Apple ranked third with 46.9 million units, with almost no growth, and its share remained at 12%. This is the top seven. The only remaining international brand among manufacturers. 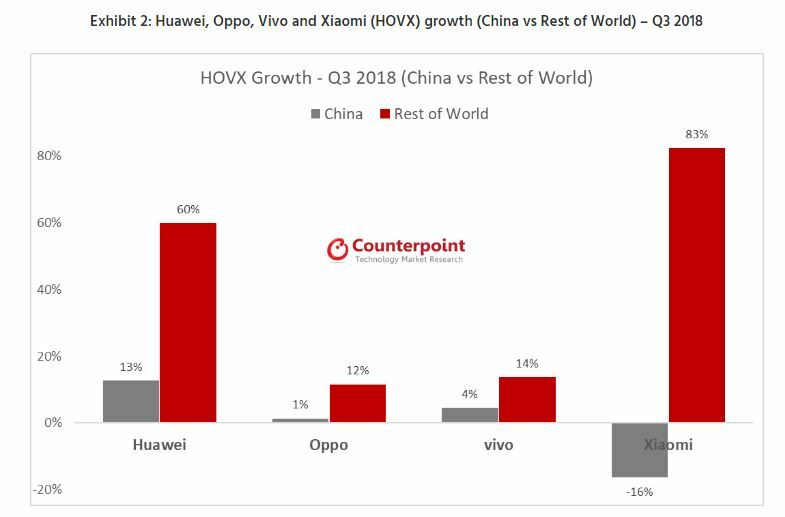 China’s mobile phone brands are relatively brighter, with Huawei growing 33% year-on-year to 52 million units, 13% of which has greatly narrowed the gap with Samsung, and Xiaomi has also increased 25% to 35.7 million units, with a 9% share. It’s not far from Apple. In fact, before the industry’s high growth in Xiaomi had long been expected, Xiaomi also constantly handed over eye-catching transcripts. 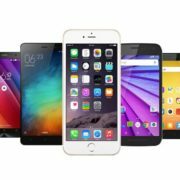 Recently, Xiaomi announced that on October 26, Xiaomi’s mobile phone shipments have officially exceeded 100 million units, and the annual target has been completed two months ahead of schedule. Xiaomi’s high-end flagship has also become a new growth point. The Xiaomi 8 series has been shipped four months later. The quantity has exceeded 6 million units. 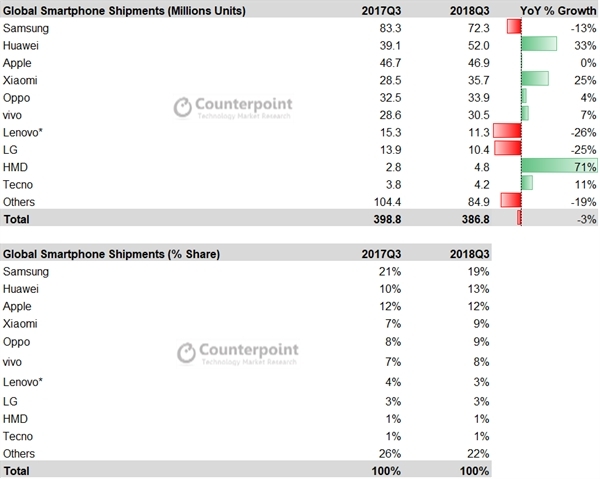 Later, OPPO and Vivo increased by only single digits, and Lenovo fell 26%. Although HMD surged by 71%, the base was too low. The major part of the growth of Chinese mobile brands is from emerging markets like India; showed double-digit growth. However, since the emerging markets are keeping under the penetration of multiple brands to make as much as revenue, alone India or other developing markets would not help alone to keep the declining of the Volume in the developed markets. Moreover, this also gives a long-term growth opportunity for OEMs with many entering such markets to grow their sales. In addition, according to the analysis of the Best-selling Mobile Phone Market in Europe in September 2018, with an overall sales volume of over 18 million units is Xiaomi’s Red Rice Note 5 followed by Huawei. P20 Lite. In addition, in emerging markets such as India, no doubt Chinese brands also have an advantage. CounterPoint’s latest data shows that Xiaomi has ranked first in the Indian mobile phone market in the third quarter with a market share of 27%, and has been leading for five consecutive quarters.